Every great home first begins with exceptional thought and inspirational vision. 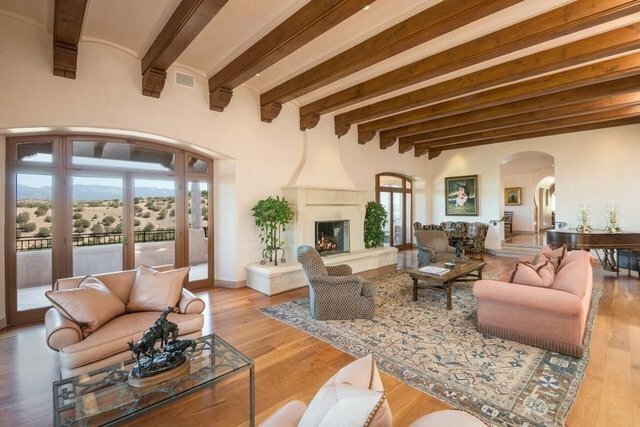 This one-of-a-kind estate property was constructed by the well-known and highly regarded Santa Fe Contractor John Wolf, known for prominent remodels and specialty residential construction. Carefully sited on 11.5 view acres in the luxury community of La Tierra Nueva, with spectacular Sangre de Cristo and Jemez mountain views from every corner of the property, this sophisticated exclave sets itself apart from the norm of Santa Fe style. The stylish mostly adobe main house captures elegance in every aspect of the architecture seen in the formal living room, dining room and library, with soft outdoor spaces captivating serenity with poolside gardens, deep sitting portales and a stately entry water feature. Care, personal comfort and attention to detail can be seen in plastered walls, radiant heating and air-conditioning, and wood burning fireplaces in both private and gathering spaces. Delightful evenings can be spent with friends and family entertaining in the 14-seat Majestic" movie theater and nearby wine tasting grotto or capturing fireside sunsets in the Torreon viewing area. Two nearby guesthouses are individually constructed on either sides of the main home, so that guests can enjoy their individual experience of luxury, each with their own gardens and private outdoor gathering spaces. This high desert estate is a quick drive to downtown shopping and eateries, as well as the Santa Fe airport. Known for its access to world-class art and food, as well as skiing, hiking, fly fishing and hunting, Santa Fe provides a huge cultural draw and a timeless backdrop for those looking to live authentically in the heart of the Southwest.